WASHINGTON — A federal appeals court sided with the Trump administration Friday in a case about the Pentagon’s effort to restrict military service by transgender people, but the ruling won’t change who can serve or enlist at this point. Earlier today Trump announced he would nominate William Barr to succeed Jeff Sessions as the nation’s attorney general. Barr previously served as attorney general under the late President George H.W. Bush. Barr is a states’ rights, religious conservative who believes women do not have a constitutional right to abortion, that Roe vs. Wade was wrongly decided, and that the legality of abortion should be determined by individual states. As attorney general under the late President George H.W. Bush, Barr was the architect of America’s failed war on drugs and the current punitive criminal justice system. Barr was and is a big proponent of mass incarceration, despite the fact that research shows such a system fosters and promotes racial discrimination. 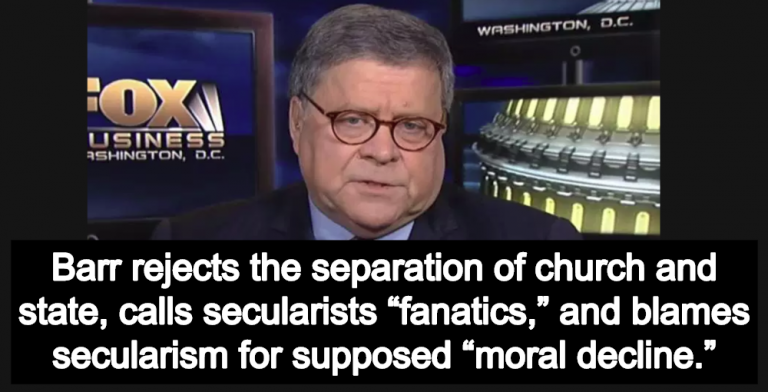 In addition to the racism and misogyny one would expect from a conservative Catholic, Barr is also a bigot when it comes to non-religious people and others who respect the separation of church and state. This moral lobotomy of public schools has been based on extremist notions of separation of church and state or on theories of moral relativism which reject the notion that there are standards of rights or wrong to which the community can demand adherence. The second way in which secularists use law as a weapon is to pass laws that affirmatively promote the moral relativist viewpoint. Such laws seek to ratify, or put on an equal plane, conduct that previously was considered immoral…Another example was the effort to apply District of Columbia law to compel Georgetown University to treat homosexual activist groups like any other student group. This kind of law dissolves any form of moral consensus in society. There can be no consensus based on moral views in the country, only enforced neutrality.